A new report on Canada’s auto industry suggests its survival will be dependant on government backing for electric vehicles and driverless cars. Support is necessary to ensure Canada can be part of the ongoing global shift to EVs. The report finds that while Canada has a skilled and experienced labour force to entice EV makers, it won’t be enough without a strong market in which to sell them. Other countries have motored ahead in this regard, perhaps none more than China, which is already reaping the rewards. And speaking of China, Vancouver-based EV manufacturer Electra Meccanica just opened a SOLO EV production facility in Chongqing this week as it aims to deliver 5,000 vehicles by the year’s end. And the opportunities don’t stop at electric cars. B.C.’s Corvus just signed a contract with Norwegian Electric Systems to install the world’s biggest marine battery on Norwegian coastal vessels. Tax season can be, well, taxing. But if you live in Saskatchewan, Manitoba, Ontario, or New Brunswick, you have one reason to be cheerful. 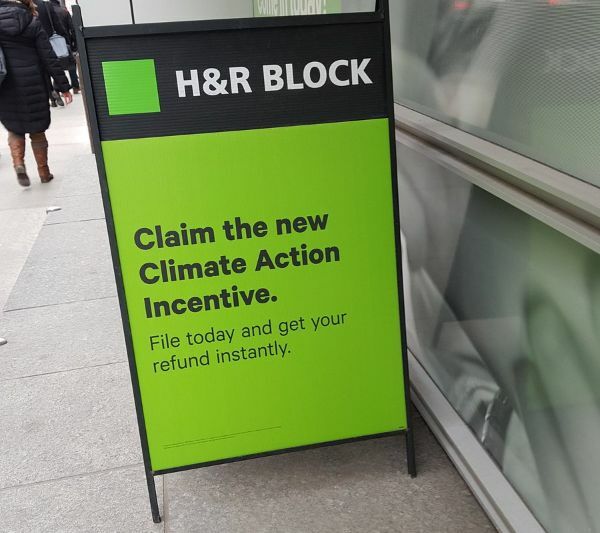 You can claim your Climate Action Incentive payment (otherwise known as the carbon tax rebate) of between $128 and $305, depending where you live. Climate change is bad for your health. Medical experts from five national health organizations have diagnosed Canada with a climate change health crisis, caused by an assortment of hazards including wildfires, power outages, tornadoes, and floods. The treatment? Refer to the second story in this newsletter. Increasingly-clean-leaning oil giant Shell is acquiring offshore wind capacity off the coast of Britain as part of its pledge to spend US$1 to $2 billion a year on cleantech. Despite the country being in politically choppy waters over its EU membership, Shell is not deterred, with the executive vice president at Shell’s New Energies saying that “supportive government policies” were more important. This op-ed by University of Regina economics Professor Brett Dolter presents a strong case for carbon pricing by explaining climate change as an “externality.” The gist is that the costs of climate change are not reflected in what we pay for things, meaning we use more of it than we would if we were footed with the true bill. In the mood for some hard truths?